If you provide your name, location, zip code, email address or phone number to receive a free flooring estimate, your personal information will only be provided to the specific carpet dealers that you choose and to the webmaster of AbcCarpets.com. 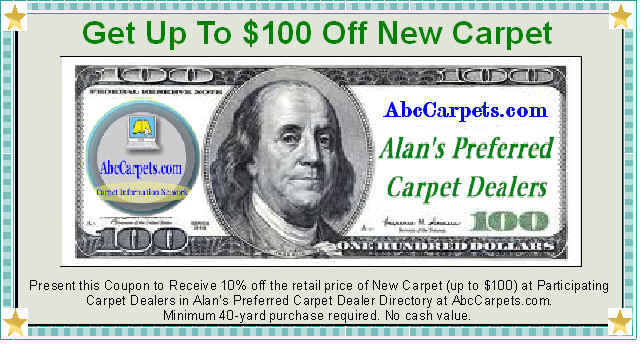 Alan's Preferred Carpet Dealers: I do my best to prescreen my special hand-picked list of Preferred Carpet Dealers to ensure you will have a pleasant experience when shopping or dealing with them. However, since I have absolutely no control over their actions business practices or professional abilities, or of their salespeople or their business practices, I do not offer any guarantees regarding your dealings with them for any reason either expressed or implied. It is your responsibility to determine if any carpet dealer is a suitable fit for you, for your needs or budget. No matter where or who you choose to buy carpet from, you buy at your own risk. I cannot stress this enough, if you have any questions please e-mail me and I will do my best to help you make wise and informed carpet buying choices. Please read my ebook before you buy new carpet, it is a major key to your carpet buying success. Although I go to great lengths to make sure my information is accurate and /or useful, I offer no guarantees whatsoever and recommend you hire and /or consult with a professional if you want absolute assurance that any of my information or advice, and your interpretation of it, is appropriate to your particular situation. The complete content of this website is the personal opinion of the author. I am not a lawyer and I do not provide or offer any legal advice. Hire an expert if you need professional advice or legal advice or services.